David Porcelijn, the Netherlands Symphony Orchestra and CPO have already put us much in their debt by exploring some hitherto unknown or little-known Dutch composers such as Jan van Gilse and Julius Röntgen. 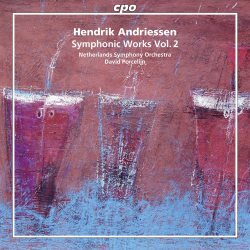 Now they turn their attention to one of the forefathers of Dutch contemporary music Hendrik Andriessen who did much to open up Dutch music by broadening its outlook, particularly towards France. Andriessen, however, always remained true to well-established tradition while not ignoring other aspects of contemporary music, at least that of his time. The First Symphony is his first substantial work for orchestra. It was composed over a fairly long period, having been sketched as far back as the early 1920s. It is a succinct and compact work in three closely linked movements, expertly scored. It may at times remind one of Albert Roussel whose music Andriessen much admired; none the worse for that. Incidentally, Andriessen's music is very often quite concise with no note wasted. The First Symphony is no exception in this respect. The Ballet Suite, which is new to the catalogue if I am not mistaken, was composed shortly after the Second World War. As the title has it, it is an abstract piece written without any plot but providing food for thought for any choreographer willing to consider it. The music is lighter in mood and brightly scored - full of memorable thematic material. It again suggests the admitted kinship with French music that was so important to Andriessen. This is an attractive and most welcome addition to the catalogue. As with so many other composers of his generation, Andriessen toyed with atonal and serial music although he never strictly adhered to it. The Symphonic Etude is one such work in which the composer used a twelve-tone theme freely handled horizontally (melodically) rather than vertically. Although the composer described the piece as a “laboratory work”, there is nothing truly experimental about it. Once again, the work is in four sections played without a break. It is laid-out as yet another compact symphony roughly cast as a theme and variations. One might think of Sibelius' Seventh Symphony that started its life as “Fantasia Sinfonica”. Symphonic Etude is to my mind one of Andriessen's finest achievements. The Kuhnau Variations (or more exactly Variations and Fugue on a theme of Johann Kuhnau) scored for strings is probably Andriessen's most popular work. Undoubtedly it is the one that put his name firmly on the musical map of his time. It has already been repeatedly recorded and I seem to remember a recording of it way back into the LP era. The composer heard one of his daughters practising the Kuhnau tune and this triggered the writing of the piece. Its lay-out is fairly straightforward: theme, five contrasted variations and a concluding double fugue ending with a short recollection of the original theme. The whole is brilliantly written for the strings. I would also mention Leo Samama's detailed and well-informed notes. I enjoyed this excellently played and very well recorded release. The second volume too is centred on a symphony. The Second Symphony is differs from its predecessor in that it is laid-out as a suite of sorts rather than as purely symphonic structure. Its three movements (Fantasia, Pavane and Rondo) suggesting – superficially at least – dance forms rather than symphonic movements. The music again looks towards France and some of the composer's musical friends such as Roussel whom he admired. Milhaud and others are also in the mix which accounts for some bi-tonal harmonies. The Pavane is an orchestration of a piano piece that he wrote for his eldest daughter. The Second Symphony is, once again a compact and economical work. Andriessen, who was an organist and who also composed works for organ, was drawn to old instrumental forms such as the ricercare. His own Ricercare is his personal take on that very form. He handles it with complete mastery so that this brilliant score, too, belongs among his finest achievements. In much the same way as its predecessor, Volume 2 includes another rarity that is new to the catalogue. Mascherata, composed for the seventy-fifth anniversary of the Concertgebouw Orchestra was premiered under Bernard Haitink. It is a suite in four contrasted movements described by the composer as “charades” (“riddles”), each movement possessing some more or less enigmatic link with characters from the commedia dell'arte: Arlecchino, Pierrot and Colombina, Leandro, and Ottavio and Scaramuccia. As Leo Samama rightly observes in his excellent insert notes, “the riddles remain”; but – and it is a big but – the music is simply wonderful. This is a marvellous score full of fine orchestral touches and memorable tunes. It is good that this work is at last available to listeners. Though it is also quite nice to have an opportunity to hear it, the rhapsody Wilhelmus van Nassouwe is not on the same level as the Ballet Suite and Mascherata. The title is that of the Dutch national anthem of which echoes are heard throughout the work although it only appears in full at the very end. The composer nevertheless cleverly eschews any jingoism which might have been a serious drawback in the hands of a lesser composer. I look forward to hearing the forthcoming instalments in what will prove a most valuable series. 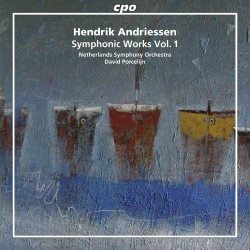 Some of you may remember that I reviewed a double-CD set entirely devoted to Hendrik Andriessen's music (Et'Cetera KTC 1307) with the four symphonies as well as a few orchestral works. Valid as that set still is, this more recent release must have the upper hand in every regard and can be safely chosen by anyone wanting to investigate this important composer's music.